With the FullStory Solutions Partner Program, digital agencies can activate new, customer experience-focused client services made possible through FullStory's industry-leading digital intelligence platform. Agencies can use FullStory to amplify their existing digital experience services while also opening the door for entirely new client services built around improving the digital customer experience. Agencies looking to tap into the growing customer experience (CX) services market can now partner with FullStory to unlock new business opportunities through the company’s industry-leading digital intelligence platform. The new FullStory Solutions Partner Program will empower digital agencies to expand service offerings across marketing, product development, and customer success, among other disciplines, as well as activate entirely new lines of business made possible through FullStory’s experience-centric technology. Today, the importance of positive customer experiences cannot be overstated. According to The Future of CX, a recent PricewaterhouseCoopers report, 32% of all customers would stop doing business with a brand they loved after a single bad experience. The Solutions Partner Program will help agencies use FullStory’s replay, search, and analytics technology to solve bad experiences as well as lean into opportunities for improvement. FullStory offers digital experience analytics, on-the-fly conversion funnels, advanced search capabilities, video-like replay of real user sessions, and robust debugging and developer tools—all while integrating with leading software-as-a-service (SaaS) products. 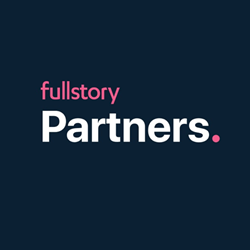 As part of the Solutions Partner Program, FullStory will educate agency partners on how to use the FullStory platform to investigate specific trouble spots in the digital customer experience, including underperforming product adoption, software bugs, landing pages, conversion funnels, and abandoned forms. Agencies currently participating in the Solutions Partner Program include Brooks Bell, Convertiv, New Republique, User Conversion, and WiderFunnel. For more information, visit http://www.fullstory.com/partners/solutions/. Founded in 2014 by former Google engineers, FullStory provides thousands of companies globally with unparalleled insights into the digital experiences of their customers. Product management, software development, marketing, and customer support and success teams at companies such as Jane.com, Icelandair, and Moosejaw all use FullStory's innovative digital experience intelligence platform to understand and transform the customer experience online. For more information about FullStory, visit http://www.fullstory.com.